20/9/10 – Deposit return – Paris, Musée du Louvre – Our article, France’s Hidden Museum, did not claim to provide a complete list of all the works unfairly deposited by museums in places where they did not legitimately belong. We therefore omitted to mention an important painting by Eustache Le Sueur (ill. 1), deposited by the Louvre in 1960 at the Château de Rambouillet, a residence which until recently had been assigned to the Presidency of the French Republic . 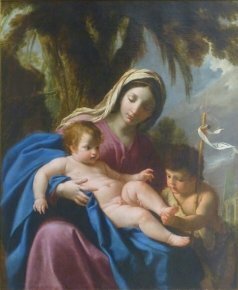 A work which was never visible as it resided in the presidential apartments and was also absent at the Grenoble retrospective of 2000, this Virgin with Child and Saint John the Baptist, looted during the Revolution from the Duke of Penthièvre’s collection, is a major discovery. Alain Mérot  dates it logically between 1635-1645, that is Le Sueur’s training period in Simon Vouet’s workshop (which he left in 1643 or 1644). Many of Le Sueur’s early paintings have been attributed to Vouet as their collaboration is difficult to distinguish, thus explaining why the work was attributed to the latter for many years before being definitively ascribed to his student by Jean-Pierre Cuzin then Alain Mérot. The canvas is now exhibited in room 19, on the second floor of the Cour Carré, next to works by Vouet and before entering the room with The Life of Saint Bruno. 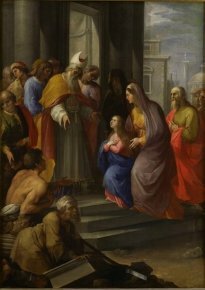 We would also like to point out in this news item on deposit returns that the large altarpiece by Cavaliere d’Arpino (ill. 2) which returned from the Senate building (see news item of 1/3/10) is currently on view as Painting of the Month until 4th October in room 17, not far from Le Sueur. We note that although the château de Rambouillet was “restituted to the Ministry of Culture on 31st May 2009”, the Presidency of the Republic and the Hôtel Matignon (Prime Minister’s office) continue to use it as they wish, as for example in November 2009 during the “Franco-Russian seminary” with Vladimir Putin. The former presidential apartments are therefore still not open to the public and visits to the rest of the domain are cancelled when the château is being used by the President. Alain Mérot, Eustache Le Sueur 1616-1655, Arthéna, Paris, 1987, pp. 175-176.